Paramount House was great. The staff knew what they were doing and acted professional. Everything was nice and clean. The rooms were good. I'd sit down and eat dinner with my wife occasionally, and the food was great. They didn't have a whole lot of grounds, but they had a garden area, bingo, and balloon volleyball. They take them out on little field trips occasionally on their bus. My mother-in-law is in Paramount House. They have studio rooms. They were nice, clean, and well maintained. They have a nice courtyard, too. The menu has a variety of food, and the dining room is nice. They had an activity room where they have bingo and another large area where they do activities and for entertainment that would come in. There's also a large, open living room with a large TV screen. She said the food is very good. We had a meal there. The staff is very friendly, and they check on her and encourage her to attend activities. They have a lot of different activities, like exercise in the mornings, walks inside or outside the building, and sitting yoga exercises. A man came in and plays the piano, and a lot of them are old tunes that people know. There was also an high school choir who came in and sing. My father-in-law is in Paramount House. We chose it because the size is perfect; it is not too big and not too small. It has a really cozy feeling and is conveniently located. It is a good place. They have holiday dinners and are going to have a Valentine Day dance. They have a piano player in the lobby all the time, live music, and a beautiful grand piano. It looks like a bed and breakfast. They serve three meals a day. The food is the weakest thing in there, but it is not bad. I appreciate what the staff is doing for my father-in-law. If you have to put your parents in a facility, financially, this is the right place to live. We liked Paramount House Senior Living. The person who assisted us was very informative and answered all of our questions. The residents were dancing in a big room while we were there. The room was kind of small. Paramount House was awesome and had spacious rooms. The staff cared about the people who lived there. They offered game nights, trips, and bingo. They could add more things to do, like a pool table, to give the residents ways to mingle more and get to know each other better. Paramount House was very bright and cheerful. The hosts were very friendly and took us around very efficiently. It was nice because it was one story, and it was very attractive. It was also smaller and more flexible. I visited Paramount House Senior for my dad and it's a nice facility. It was a good experience. The people were very helpful. It was clean and nice and they seemed very willing and caring. The apartment that I saw was very nice. It was a studio and the place was very clean and spacious. It had a big closet. The location was okay. There's 2 busy streets but it's behind other buildings so if one of the residents walked out, they may have an issue with traffic. I didn't really check out the grounds much but it presents well when you're driving up to it. I visited Paramount House. The whole operation, the building, maintenance and the staff were excellent and excellent in how they treated my family and my father. They contacted us afterward and followed up to see how we and my mother were doing. My father spent five days there in hospice. The food was great. They had bingo, entertainment, and other things. The price was reasonable. I visited Paramount. They have very nice rooms of a nice size. They keep the place nice and clean. The staff is friendly. They have bingo, church, and bible study. I thought Paramount House Senior Living would be a very welcoming environment for my mom and dad. When I walked in the door, the restaurant was right there off to the left. It smelled good, and it looked good. I really loved the way everything looked. It looked very warm. There were a lot of things going on, and they had a lot of activities posted. It seemed like a very nice place to be. It was a really good value for the money they were asking. We chose Paramount House for my 90 year old father because the feeling I got as I walked into the facility was that it is truly welcoming. The food is good and the room floor plans included fold down padded walk-in showers in the large bathroom. It is located very near Travis AFB and the Paramount shuttle bus schedule is more flexible and more frequent than other facilities that I visited in this region. Because it is privately owned the "move-in special" was offered. I also learned that the care level determination that plays an important part in the cost of renting an apartment was mentioned right away so that the accuracy of this assessment during the first 30 days might not change drastically and become a surprising increase in rent. The other assisted living facilities didn't mention this so I appreciated the honesty of Paramount House. My father seemed to be approving of the social environment and he liked the fully furnished respite room we chose as a transition before a permanent move to one of the apartments there. Anything that I asked or that my father asked was patiently explained with courtesy and friendliness. My father seemed to be content with our choice. My mom is living now at Paramount House for about two months. My sister found the place and everybody liked it. It's working out well for my mom. We are all pleased with the facility. She has been treated right and they are managing her pills very well. They seem to have the whole 9 yards for her. We look out several places and this one turned out to be the one that mom really liked. She is making friends and everything is working out fine. Paramount House is definitely one of the nicer facilities that I have visited. The demographic of Vacaville has always been easily relate-able for me. So naturally we have many family friends that live in the area. Unfortunately one of our very close family friends was recently diagnosed with Alzheimers. 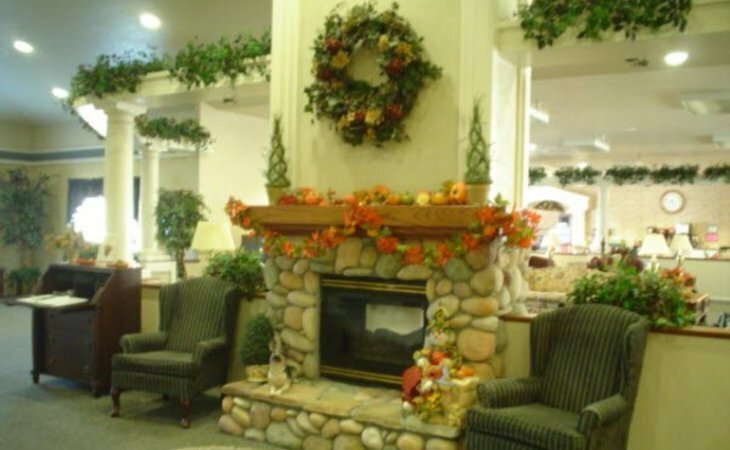 As a result we and his family sought out a convenient yet reliable assisted living facility. Paramount house, because of its location was the prime choice. Upon our initial walk through we weren't too convinced that Paramount House met our standards. That was of course up until we ran into one of the nurses on her break. She was the kindest and most welcoming person I have ever met. Regardless of the fact that her shift had already ended she insisted on giving us a tour. She gave us a "behind the scenes" look at the inner working s of Paramount House, everything from the daily organized activities to the laundry services offered to residents. She even introduced us to some of the staff who were still on duty, all of which were equally warm and kind. This facility is clean and neat and beautifully decorated inside. The dining facilities are very nice. The food is good and the dining area has the feel of a restaurant. The staff is very kind and helpful to the residents. The individual rooms are spacious and have the feel of little apartments. Each resident brings in their own furniture and makes it home. There are a variety of activities available to the residents to keep them entertained. The residents are encouraged to find an activity that suits them to keep them socialized. One day I saw staff playing a game with a big ball with he residents for exercise. The staff was very enthusiastic and the residents seemed like they were really enjoying themselves. The staff was very encouraging. Some negatives of he facility would include that sometimes some of the residents clothing gets switched with other residents. The facility is located in a parking lot next to a Walgreens. There is nothing but cement and streets outside to look at if you wanted to go outside and sit. However, there is a nice green inner courtyard area. There is greenery planted outside windows. Overall it is a nice facility. Paramount House seemed very neat and organized. The staff seemed fine. They had little apartments. We didn't choose it because it seemed like it had too much room for my sister and she wouldn't come out often enough. Paramount House Senior Living located in the heart of Vacaville just off Interstate 80, is known throughout the valley for great quality of life for residents. Recognized for longtime staff, quality care and engaging lifestyle, life is good for residents at Paramount House. The good life begins by choosing a residence option that is best suited to your needs. Residents may opt for studio and one-bedroom apartments each with private bathrooms and individual climate control to ensure your comfort. You still maintain your independence, but assisted living services are there when needed. There is also a secured memory care wing at Paramount House. We are a boutique community consisting of 61 Assisted Living apartments and 20 Memory Care apartments. Located all on one floor, residents can easily find their way to their apartment from the dining room and common areas. We have ample parking for guests and residents. We have spacious studios, one and two bedroom apartments and large bathrooms with roll-in showers. We have a few courtyards for our residents to enjoy the outdoors. Stop by any day for a tour and feel free to join us for lunch so you can taste our wonderful home cooked meals. What should caregivers and potential residents know about Paramount House Senior Living?